“Growth in the industry has been nearly flat most of the year thus far”. This adds to the disappointing picture in the BRIC economies, which account for over a fifth of the global economy, as I discussed on Friday. Brazil has been negative for the past 12 months: Russia has collapsed from 15% to 5%; India has been the best performer, being stable at around 4.5%; China has slowed further from 4% to 3%. As in 2008, of course, most commentators are still convinced that everything in the garden is rosy. I fear, however, that soon they will once again be excusing their mistake, by telling anyone who will listen that “nobody could have seen this downturn coming”. The reason for their mistake, as in 2008, will simply be that they were looking in the wrong place, by focusing on the positive signals from financial markets. But these lost their key role of price discovery long ago, due to the vast wave of liquidity provided by stimulus programmes. 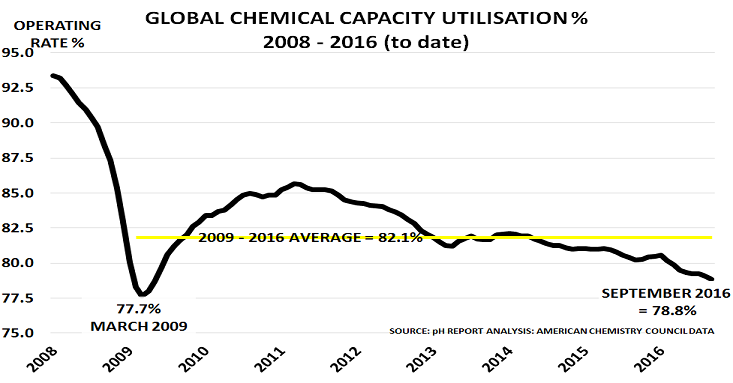 Unless we see a rapid recovery in the next few weeks, prudent companies and investors would be well advised to heed the clear warning from chemical markets that global recession is just around the corner. Oil markets are entering a very dangerous phase. Already, many US energy companies have gone bankrupt, having believed that $100/bbl prices would justify their drilling costs. Now the pain is moving downstream. The problem is the central banks. Hedge funds have piled into the oil futures markets since January, betting that there would be lots more free cash from the Bank of Japan and the European Central Bank. They also gambled correctly that the US Federal Reserve and Bank of England would back off the idea of interest rate rises. This move had nothing to do with the fundamentals of supply and demand, which are still getting worse, not better. As I describe in the video interview with ICIS deputy news editor, Tom Brown, the rally mirrors what happened a year ago in the SuperBowl rally – when traders put about the story that a fall in the number of US drilling rigs would reduce production. Of course that didn’t happen, because the rigs are becoming very much more productive. But the hedge funds did’t care about that – they simply knew there was money to be made as the central banks handed out vast quantities of free cash. Now the central banks are doing it again. And so, once again, oil prices have jumped 50% in a matter of weeks, along with prices for other major commodities such as iron ore and copper, as well as Emerging Market equities and bonds. In turn, this will force companies to buy raw materials at today’s unrealistically high prices, as the seasonally strong Q2 period is just around the corner. Some may even build inventory, fearing higher prices by the summer. 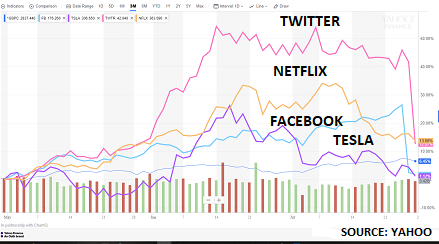 If this happens, and prices collapse again as the hedge funds take their profits, many companies will face the risk of bankruptcy as we head into Q3. They will be sitting on high prices in a falling market – just as happened in January. Only Q3 could be worse, being seasonally weak, and so it may take a long time to work off high-priced inventory. We cannot stop the central banks handing out free cash to their friends in the hedge fund industry. They think high commodity prices are good news, as they might create inflation and reduce the real cost of central bank debt. All companies and genuine investors can do is to instead avoid taking any positions, long or short. As experienced poker players say, “If you don’t know who the sucker is at the poker table, then it is probably you”. This also confirms the core argument in Boom, Gloom and the New Normal, which suggested the global economy was entering a New Normal. $35tn of stimulus hasn’t restored growth to SuperCycle levels, as the IMF has noted. Instead, the ‘demographic dividend’ that drove the economic SuperCycle has become a ‘demographic deficit’. Xi and his colleagues have prepared for this New Normal for 2 years. As before in times of Crisis (Deng in 1977, Jiang in 1993), they have taken detailed advice from the World Bank. They know that China has to reverse its economic course. And the time to make the break with the past is when you start, when people are ready for change. I will look in more detail at some of the key implications of the Great Unwinding tomorrow and during the rest of this week. Of course, the Fed launched their QE low-cost money policy with the best of intentions. They genuinely thought that a higher stock market would boost consumer spending by creating a new ‘wealth effect’, and that this would then encourage companies to invest in new capacity, thus boosting employment. Unfortunately, the data shows that fewer Americans own stocks than own houses – only 52% versus 65%. So the impact of higher stock prices hasn’t actually helped to boost spending, particularly as real household incomes remain well below pre-Crisis levels. Instead we have seen a growing divergence between the performance of the stock market and the wider economy – the opposite of the Fed’s intention. So the question now is very simple. Will the economy suddenly start to respond to the Fed’s policy? That, of course, would be very welcome, if it happened. Or will the Great Unwinding now underway in oil and currency markets start to impact equity markets as well? 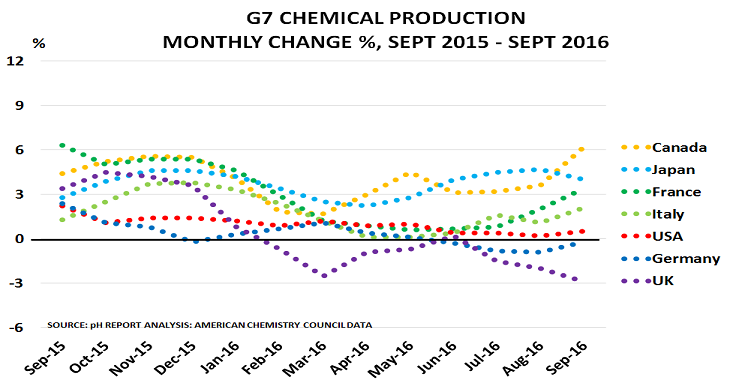 The chemical industry is also, of course, also a good leading indicator. It tends to pick up around 6 months before the wider economy, and to turn down in advance as well. And its Q2 downturn was a clear signal that H2 would be more difficult that expected. Now the the Boom/Gloom Index is reinforcing that message. Both indicators may be wrong, and the stock market right. But the blog certainly wouldn’t plan ahead on that basis, if it was still running a major chemical business today.